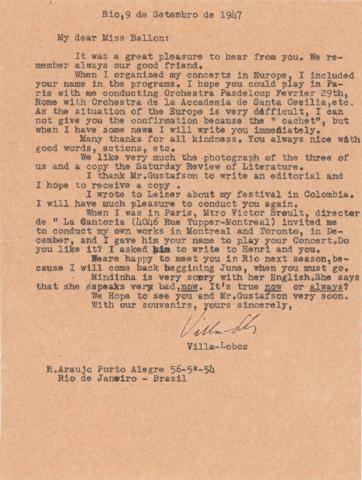 Item is a typed letter from Heitor Villa-Lobos to Ellen Ballon written on September 9, 1947. The letter details some potential performances of Villa-Lobos' compositions and his desire to have Ballon perform his music. Item is accompanied by the stamped air mail envelope in which Ballon received the letter. Two Brazilian postage stamps are affixed to the envelope.